We were sent a mini 50th anniversary Play-doh fun factory to review and from the second we opened the parcel I was dying to get my hands on it!!! I remember loving play-doh as a kid but we haven't really played with any since Chick was small!!! My thoughts: This is definitely value for money as Chick even at 7 has played with it constantly and she and her Dad spent the whole of his last visit making things for each other! The pots of play doh and the knife all fit neatly inside the fun factory so storing it is super simple! What I'd forgotten about play doh is that it gets flipping everywhere and is very easily trampled into my beautiful cream carpet!!! It does smells divine though! Chick says: I like it because it's creative and I like making things but it was the best fun playing it with Dad. The best thing I've made so far is a face with long straggly hair. The set retails for around £7.99 and can be bought at the usual toy outlets. We've been sent lots of lovely crafty things so far in our Toys R Us boxes and this one was no exception. 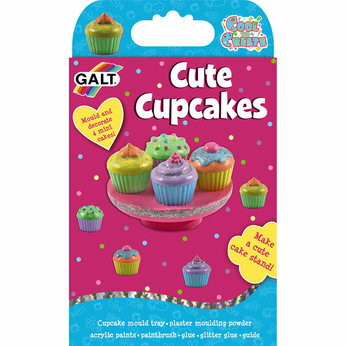 In our latest box we received some 'cute cupcakes' which at first glance looked like a cup cake making set however, upon further inspection we discovered that it was actually a plaster of paris kit. The kit comes with a mould tray, plaster moulding powder, acrylic paints, paintbrush, glue and glitter glue along with a simple step by step idiots guide just to ensure you know exactly what you are doing!! The mould tray has a compartment for making the cup cake stand too so you don't have to do this as an extra. The kit is recommended for children ages 5+ for health and safety reasons but I'm sure Chick could've handled this at a younger age with a little extra help from me. My verdict: Simple enough for kids to do but Chick didn't like having to wait the 24 hours for the plaster to set before she could paint them. I would definitely buy these as a stocking filler or as part of a birthday present as they are good value at £5.99 and Chick did enjoy making them. Chick's verdict: It takes a long time but they look real and like the cakes were made by a professional!! Overall a thumbs up from us. Cute cupcakes are available to buy from Toys R Us. 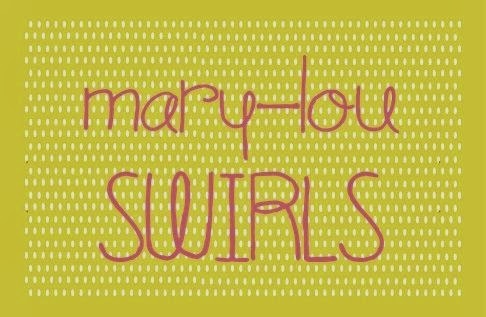 Become a fan of their page on Facebook for updates and some great competitions. We are generally big fans of most books so it will come as no surprise that we really liked this one. There was lots of stuff that I loved about it. The crafts included were suitable for everyone from beginners like me to people that can actually knit, sew and follow patterns. 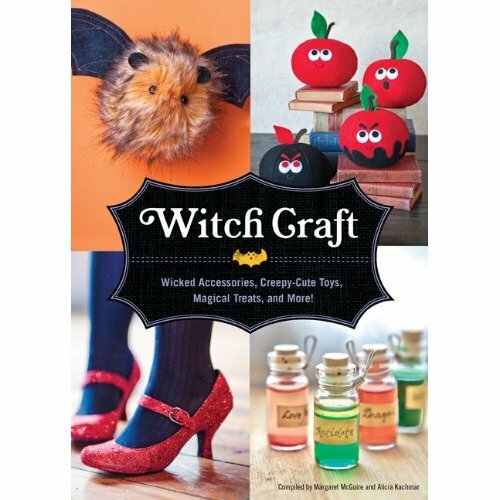 There are instructions for everything from decorating marshmallows with scary skeleton faces and cross stitch earrings right up to knitted witches, crocheted caps and net skirts for those real crafters! All the instructions are easy to follow in a step by step guide. 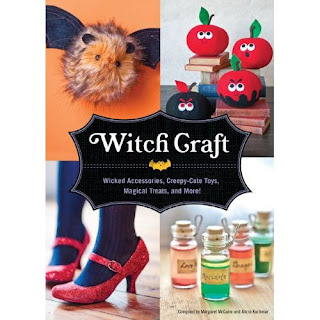 The first couple of pages give you all the abbreviations you will need to know and there is a stockist list at the rear of the book mainly for online stockists which is great for people like me that live in a town without many craft shops!!! All the crafts are designed by bloggers like us with their own blogs and websites so you can even ask for more advice or instructions if you need them! The pictures are bright and colourful and we are really looking forward to making some of the simpler things on offer!!! First on our list is to make us both a pair of red sparkly Dorothy shoes a la 'The Wizard of Oz'!!!! Available to buy from 1st October at the usual online stockists here and here for around £9.99. If you'd like to enter the giveaway then the usual rules apply. All you need to do is become a follower of this blog or my main one or 'like' my page on Facebook and then leave me a comment letting me know that you've done so!! Closing date is Friday, 1st October at 5pm and the winner will be drawn soon after and will be among the first to get their hands on this new release! Good Luck!!! 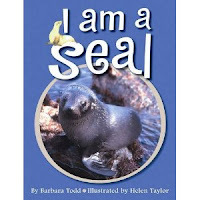 I am a seal is a lovely book aimed at 4-6 year olds. I loved that it was bright and cheerful and that the rhyming language was easy to understand and flowed very well when reading it aloud. It uses illustrations as well as pictures and covers feeding habits (bit of a gory picture!! ), typical habitats and the different types of seal. I also have a copy of 'I am a Seal' to giveaway. To enter all you need to do is leave me a comment letting me know that you are a follower here or at my main blog. Alternatively you can 'like' me on Facebook!! Good Luck! The three books in the series are available to buy online here and here and from all good book stores and cost around £4.99. We received our second Toyologist box this week and this was something that Chick pounced on. We already have a big Fur Real dog that yaps and moves around the house (and generally drives me crazy!!) that she is a massive fan of and that I am not!!! I have to admit to being disappointed with this toy. It doesn't do anything apart from what you see in the video and after only one night Chick is already bored of it as much as she says she loves it!!. Personally I wouldn't buy one of these for her as at £7.99 it's a bit pricey for just a wagging tail but I maybe persuaded to let her spend her pocket money on it if she chose too. It's marketed at aged 2+ but as she is still into cuddly toys this was ok for her. My lovely daughter just doesn't like to sleep. She is the Queen of Procrastination at bedtime (and most other times actually) and I think that's part of the reason that she loved this so much! 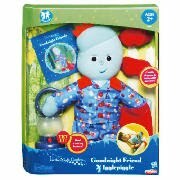 Iggle Piggle comes with his own pajamas and slippers so that your child can dress him at the same time as themselves and is a learning tool for the younger kids. This appeals to Chick as she is very bossy and loves getting any toys un/dressed. It also comes with it's own lamp and book for them to read to Iggle Piggle as they snuggle up together in bed which Chick found to be great fun and read lots of other stories to Iggle Piggle by lamp light too!!!! An added bonus for me was that the batteries are already installed.....other toy makers take note!! In all I thought it was a good toy especially for ages 2-5 years and I'm sure that if Chick had been younger it would have been trailed around everywhere!! It retails at around £19.99 and is available from most toy stores. 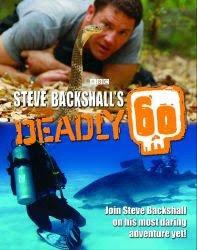 *Don't forget that you can still enter the giveaway to win a 'Deadly 60' book here. This giveaway is now closed but please look out for more coming this way very soon! Yet again you get a lovely Vlog of me this week!!! Not sure that you can really see the book so you'll have to take my word for the fact that it's fabulous!!! Would make a brilliant Christmas present too! To enter you just need to leave a comment letting me know you are a follower of this review blog or over at my main blog here. Alternatively you can 'like' me on Facebook!! Available to buy from all good book stores and online costing around £9.99. Good Luck!!! Closing date: 17th September 2010. This competition is now closed. please keep checking back for more great giveaways! The range is all about soothing tired, heavy,achy legs and is aimed at those with sedentary jobs, holiday makers who may be sitting for long stretches on flights and pregnant Ladies. The capsules contain 'a natural and unique red grape vine leaf extract that helps avoid swelling of the lower legs & feet when taken for four to six weeks' these aren't suitable for the pregnant though! I was sent a sample of the cooling leg spray and if I'm honest I wasn't really expecting great things from it and presumed it was a gimmic to persuade us to part with more hard earned cash!! Having tried it though I'm a bit of a convert! In my job, I have days where I barely move from my desk at all and then when I come home and Chick is in bed I'm stuck with the laptop on my knee and still not moving around!! The first thing that struck me about the spray was the smell....it's absolutely gorgeous! I sprayed it on (without reading the instructions!!) which was nice and cooling and then wondered why it sat on the surface of the skin!!! Obviously I then read the instructions which said you need to massage it in to stimulate your legs!! My legs did feel much lighter and obviously any excuse for a massage is a bonus!!! Antistax Healthy Active Leg Capsules® are available from www.antistaxuk.co.uk, Boots, Tesco, Sainsbury’s, Superdrug, Wilkinsons, and Morrisons, and chemists across the UK. Antistax Healthy Active Leg Capsules® are available in 50s (£7.82) and 100s (£14.67). Antistax Cooling Leg Gel® is £5.49 (RRP) and Antistax Cooling Leg Spray® is £5.99 (RRP -available in Boots only). I have five bottles of Antistax Leg Cooling Spray to giveaway. Usual rules apply you just need to follow me here or over at Adventures of an English Mum and leave a comment letting me know that you do. *Unfortunately this one is for the UK only. If you could e-mail me at adventuresofanenglishmum@gmail.com with your address and I'll get them sent to you early next week! Watch out for more giveaways coming this way very soon!!! I would definitely recommend this and can see me buying it for a couple of birthday's that Chick's friends have coming up. It's marketed at age ranges 5+ which I think is about right as younger children may struggle with having to be so precise with the squares! The only downside for me (and I'm really nit picking with this one) is that the colours are not particularly clear. There is a numbered coded colour chart but we got our purples mixed up.....obviously completely my fault as Chick is perfect!! Numbered squares would have been extremely helpful! The various sets retail at £14.99 and are available from Toys R Us.